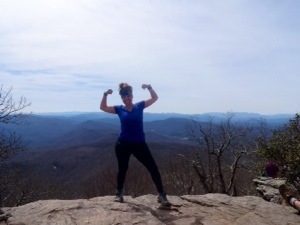 So when I decided to start a blog to share my adventures and experiences on the AT I envisioned telling countless stories of fun times, amazing hikes, and pictures of my sculpted calves. However, I did not anticipate the possibility of sharing challenges and struggles that I normally would not care to admit with even my closest friends. I thought about skipping these parts over completely (gotta save that dignity) and only focusing on the good. But then I realized I want this blog to be an accurate representation of my time on trail and that includes that trials. I’ll try to save some of the mushy gushies for my journal and I in no way want this to become a trail diary, but here is what I’ve been up to these last few days! After months of slaving and planning away what to pack, suddenly the morning I was about to fly to Atlanta I doubted every decision I had made. Everything from sock choice to what-in-the-actual-heck-am-I-doing-with-my-life-I-am-not-about-to-go-live-in-the-woods-for-6-months. But alas. I created this blog and bought a plane ticket. 2 very hard things to back out of. I was too nervous and emotional to eat and was already sad from saying goodbye to my brother earlier that morning, knowing a goodbye to my mom, dad, and sister was coming made me constantly weepy. All of this talk of a new adventure and suddenly it all became real once I had to say goodbye. At the airport the tears did not cease until after take off. The fact that I was so sad made me nervous- was I making the wrong decision? At the Atlanta airport my ride (Hank) informed me that there was another girl (Sam) on my flight who was hiking the AT and also needed a ride. Yay! Hank was amazing. 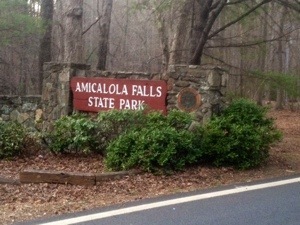 Drove us to get fuel for our stoves and took us to chick-Fill-a (great place to stock up on condiments btw) and then to Amicalola Falls State Park. Weighed my pack. 40 pounds without water. SHOOT. Well guess the second guessing and just shoving everything into my pack wasn’t the best strategy after all. Stayed at the Max Epperson shelter and made great friends! We would all hike the approach trail in the morning! Before bed my feelings of anxiety were high but reading the shelter registry and realizing that we all have our fears but in the end what the trail holds is unknown for all of us. Woke up with lots of excitement and nerves, today was the day! 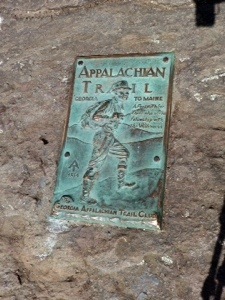 The hike to the AT! 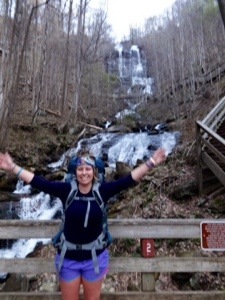 I was so happy to be doing the roughly 9 mile Approach and was excited to see the waterfall. Sure I heard it’s tough and the 604 stairs hurt but how hard could it be and why wouldn’t you do it? YOHO. After a chipper stop in the visitors center I was ready to rock! By the (short) time I reached the stairs I could already feel ever single one of the 40 pounds on my back. I made a list of everything I wanted to send back home and almost turned around. However I decided to wait until Neel Gap before sending stuff back. But in that critical moment I should have turned around because I had forgotten to things. One I would find out very shortly, the second 9 miles later. Time to climb! I could only imagine what those Georgian inmates were thinking, laughing to themselves as they built the staircase to hell knowing unsuspecting hikers would willingly try to climb it. Mother forgive me for the words that came out of my mouth as I dragged myself up the stairs gasping for air as everyone passed me. When I finally got to the top (the view made it worth it-gorgeous!) I did the normal thing and puked behind a sign. Super classy. It was only 9 or 10 and the sun was already beating down it’s rays and it was hot! I slowly began the ascent up the trail and quickly realized in my excitement to leave I had only filled one water bottle. 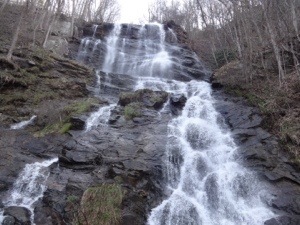 I only had 1liter of water for a casual 9 mile hike up a mountain in temperatures only familiar to Hades. There were no water sources until the 7th mile. 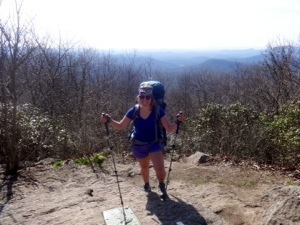 In my continuous struggle climbing, pausing every 5 steps to take a break I was excited to be on my way to the AT but I had many doubts on my ability to actually get there. When I finally made it to water I was rejuvenated and met the rest of the approach trail crew at the shelter before the hike up Springer. After panting my way slowly up and falling farther behind I finally made it to the top of Springer Mountain! 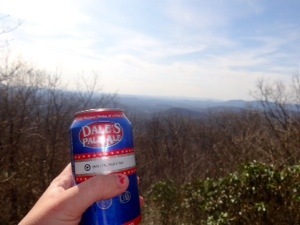 Celebrated with some trail magic in the form of a Dales Pale Ale. The view was breath taking and you could see for miles! I went to get my phone to take pictures and realized it was no where to be found! I must have dropped it somewhere on the approach trail. As the night went on I got extremely homesick and doubted whether or not I would be able to keep hiking the next day. I was feeling down and gave myself a week before I threw in the towel. I woke up early to get a head start on the trail. Compared to the approach hiking the next day was a breeze! 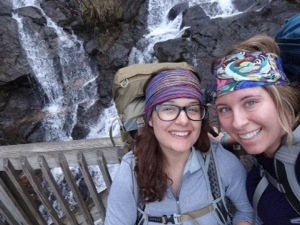 Met a couple of thru hikers on the way. Everyone is so friendly and it’s great meeting new faces on the trail. It warmed up fast and was another crazy hot day. Stopped at Hawk Mountain Shelter and forced down some lunch. The combination of hot weather and my emotional roller coaster eliminated my appetite but I knew I needed energy. The shelter quickly turned into a social gathering and met new hikers and reacquainted with old. Sam, Emma, XC Crow and I decided to hike on. Camped at Horse Gap for the night My feet where really sore but I felt good about the 10 mile day wand was in good spirits. Woke up eager to hike! Hot the trail around 8:30 to climb Sassafrass Mountain. 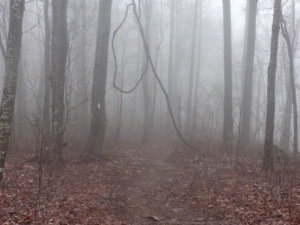 The fog was thick and made the woods look spooky cool. I’ve got a hotspot on each arch that will be blisters soon and my supports are pretty rough on my arches, but other than that I feel great! Had a lot of times where I was feeling just dandy about being in trail and Maine seemed more of a reality. 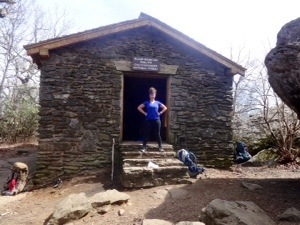 Stopped at Gooch Mountain Shelter for another forced lunch and met more hikers- it’s been so fun meeting so many people. I wanted to push on so Sam and I hiked on. I’m noticing my trail legs coming in and I’m taking less breaks on the inclines. Saw some great views at Liss Gap and it’s cool to see so many different environments on trail. There will be areas that are bare and others that are lush and green make you feel like you are hiking in a jungle. 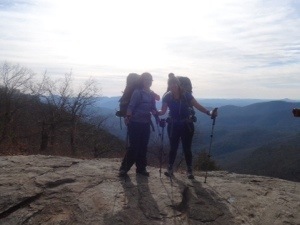 Camped at Woody Gap after hiking Sassafrass, Justus, Gooch, and Ramrock Mountain and was feeling great! I’m feeling stronger and certainly smelling stronger too! Woke up freezing this morning with my hammock tarp blown in. The gaps tend to funnel the wind and It was crazy windy. Bundled up in all my layers and licked a frozen granola bar for breakfast. Headed out with Hemlock (Bill), Fletch, Sam, Mark, and Steve (Grunt) and kept a great pace and got a great view on Preaching Rock. 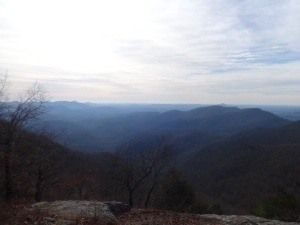 Climbed Big Cedar Mountain, Gaddis Mountain and then finally the legendary Blood Mountain! Dun dun dunnnn. Within a mile there is about 750 plus foot elevation increase and lots of switchbacks. But at 4,500 feet the view was breath taking! Blood Mountain Shelter was built in 1934 and has crazy character. In each shelter there is a trail registry where you can sign in and read who else has been there and their stories- it’s really cool when you get to know hikers in front of you without ever meeting them. After the climb down Blood we made it to Neel Gap and Mountain Crossings Outfitter! It was so cool and saw many familiar faces. Everyone stocked up on pizza and candy bars. 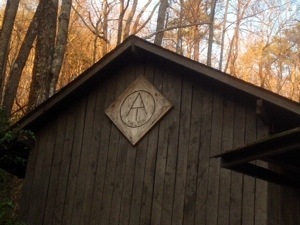 Sam, Fletch, Hemlock, and I all split a cabin at Blood Mountain Cabins (soon to be the title of the next horror film). Another group of hikers we met earlier that day did the same and I and another hiker went into town to get pizza and beer AKA the hikers essentials. 4 large meat lovers pizzas and 4 cases of beer later it turned into a great night! What a tough life us hikers lead. In the morning I gave my pack a shake down and sent about 4.5 pounds home. I was almost sad to see it go. I was ahead of a lot of people I had started with and if I could make it this for with 42 pounds why couldn’t I make it to Maine with that? But my back thanks me. I also had managed to track down my phone and was able to get it dropped off to me at Neel Gap! Woo! 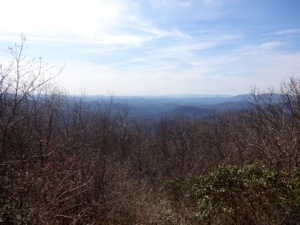 Hiked Levelland Mountain, Wolf Laurel Top, Cowrock Mountain, and Wildcat Mountain. Wildcat Mountain was tough. I heard someone say anytime you come to a gap with a road you pay the price in the climb you are about to do. True dat. I lead the charge up it and it felt good! We knew rain was forecasted for the night and thought it would be smart to stay in a shelter. However, the closest shelter was an extra 1.2 miles of the trail. After what felt like hours trying to find the shelter we finally found it and set up. I hung up my tarp o the outside of the shelter to try to prevent any rain from coming inside. Had a great fire and hiker camaraderie before the rain hit. 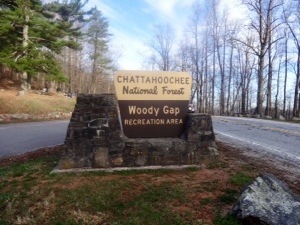 Day 7: Whitely Gap Shelter to Unicoi Gap into Hiawasse, GA 15.7 miles. 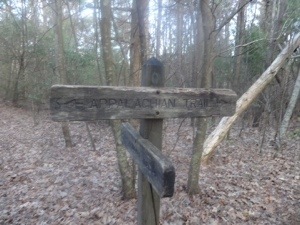 This entry was posted in Uncategorized and tagged Neel Gap, Springer Mountain. Bookmark the permalink. ← Homemade Appalachian Trail Granola! Total Noms. Oh yay!! And good I’m glad he signed up too. The calves are coming in nicely and I’ll be sure to post some pics of those soon! Thanks so much Robin, love you too! Ahhhhh- so proud of you!!!!! This makes me do happy! What an adventure. You are amazing! Just keep singing “The Seven Things”. Miss you lots! By the time you get back I will have a little hiker myself (she’s due in Sept.). Good luck my friend!